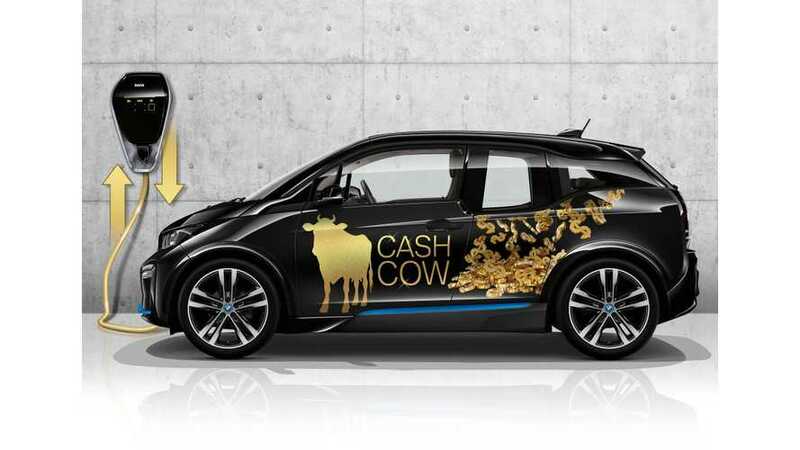 BMW i3 As A Cash Cow? BMW i ChargeForward - supports the grid and the pocket. Since 2015, BMW and PG&E offers for its customers in the San Francisco Bay Area in California a special "BMW i ChargeForward" related to plug-in car charging. The idea is to enable PG&E to take control of the charging of the car connected to the charging station to lower peak demand, increase usage of renewable sources and, in general, to stabilize the grid in exchange for money. The BMW i ChargeForward began in 2015 with 100 BMW i3 and now some 350 BMW/MINI and PG&E customers are onboard. You can still join the program and get up to $900 in incentives if you qualify (see website here). Electric vehicles can help stabilizing the public grid and maximizing the portion of renewables. Drivers are willing to change their charging habits in order to align with renewables, given the right messaging and incentives. Energy companies can help increase daytime charging with renewables by supporting companies in adding workplace charging. Sharing data with other drivers is a motivator for many participants. Programmes like ChargeForward improve customers’ understanding of how the grid works, which helps them become more educated energy consumers. "The bottom line is that owners of all electrified cars could be able to make their high-voltage batteries available as a flexibility buffer for power generated from renewable sources. At the same time, they could receive bonuses by charging their vehicle at the best possible time of day – and therefore maximising the proportion of solar energy they use – whether they are at home or out and about and using a public charging facility. "As California advances toward a carbon free economy, this collaboration demonstrates how utilities and automakers can partner to more efficiently utilize the grid through smart and managed charging. Together we are paving the way for the rapid growth of electric cars and achieving a clean and sustainable energy future", adds Steve Malnight, Senior Vice President, Energy Supply and Policy Pacific Gas & Electric. ChargeForward brings CO2-neutral electric mobilityand efficient, environment-friendly electricitysupplyanother step closer together. The innovation project launched byBMW iand power supplier Pacific Gas&Electric (PG&E) in theSan Francisco Bay AreainCalifornia has been running since 2015. Currently,350 owners of electrified vehicles from the BMW and MINI brands who also have aPG&E supply contract are taking part in the pioneering fleet trial. TheChargeForward pilot projectin Californiais stepping up the ways in which electric mobilitycan link with eco-friendly changes inenergy use. The project is bridging the gap between electric vehicles and the public gridwith at echnology that hasthe potential to make electric driving emission-free not only locally but across the board. Key elements here include daily forecasts from energy providers on when and how much electricity from renewable sources will be available on thegrid. Customer requirements and preferences regarding vehicle usage periods and parking times are also taken into account. The ConnectedDrive telematics unit fitted in all BMW vehicles and the BMW Connected app play a crucial role here. When the ChargeForward project was launched in 2015, around 100 BMWi3 drivers downloaded a ChargeForward app which allowed flexible vehicle charging from the electricity grid. This meant the charging process could be paused when the grid enjoyed particularly high demand and then restarted when the peak had tailed off again. Drivers would be informed of any charging pauses by a message to their smartphone. As a customer only rarely needs to use the whole time their vehicle is parked for charging, in many cases they would be able to benefit from periods when electric isavailable at lower cost. This would also present an easy way for the energy company to avoid grid overloads and ensure consistent and therefore efficient supply. Since2017, the results of the second phase of the project have shown how a flexible charging strategycan contribute not only to stabilising the energy grid but also increasing the proportion of green energy sourced forel ectric mobility. Around EarthDay earlier this year, carefully managed charging in sunny California enabled greater use of electricity generated from renewable sources. Around 350 BMW i car drivers participating in the ChargeForward project were prompted to charge their vehicles’ high-voltage batteries during the day. In this way, they prioritised those periods when solar energy was available in particularly large quantities. This meant approximately 56 per cent of the power they fed into their vehicles during the test period could ultimately be sourced renewably – and more than half of the project participants’mileage in their BMW i3carsduring the test was therefore completely CO2-neutral. By comparison, the average percentage of renewable energy for the US stood at just 22 per cent. The Governor’s Global ClimateAction Summit in San Francisco brings together international representatives from politics and government, environmental associations, business and industry to discuss the impact of climate change and possible measures to counteract it. The event shines the spotlight on ways to reduce CO2emissions generated by humans. TheBMW Group is contributing to the summit in various ways –e.g. witha run-downof the conclusions from the phases of the ChargeForward project completed so far and a presentation of further initiatives aimed at integrating electric mobility into a sustainable and largely CO2-neutral energy supply system. By pressing ahead with the ChargeForward project, BMW iand PG&E are showing their commitment to further incentivising intelligent charging and to incorporating electric vehicles into the public energy grid even more efficiently.In the near future, high-voltage batteries from electrified BMW and MINI cars should be able to not only take on as much renewably sourced electricity as possible, but also feed it back into the grid, when there is a shortage of electricity from renewable resources. By acting as temporary energy storage facilities, they can help to stabilise energy supply. For example, they can be used to cover load peaks inenergy generation from wind and solar power (e.g. on particularly windy or sunny days) and channel the energy stored back into the grid in the evening, whent he sun has set and demand is elevated."